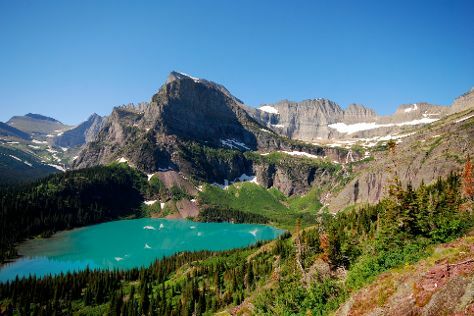 Get outdoors at Waterton-Glacier International Peace Park and Grinnell Glacier. Go for a jaunt from Glacier National Park to Polebridge to see The Polebridge Mercantile about 50 minutes away. Next up on the itinerary: cruise along Going-to-the-Sun Road, take in the dramatic scenery at Virginia Falls, hike along Avalanche Lake, and tour the pleasant surroundings at Highline Trail. For maps, more things to do, and more tourist information, read our Glacier National Park online trip maker . Montgomery to Glacier National Park is an approximately 10-hour combination of bus, flight, and taxi. You can also do a combination of flight and taxi; or drive. You'll gain 1 hour traveling from Montgomery to Glacier National Park due to the time zone difference. Expect slightly colder weather when traveling from Montgomery in June: highs in Glacier National Park hover around 75°F, while lows dip to 45°F. Wrap up your sightseeing on the 9th (Sun) early enough to drive to Great Falls. Great Falls is a city in and the county seat of Cascade County, Montana, United States. Get some cultural insight at Lewis and Clark Interpretive Center and C.M. Russell Museum. Step out of the city life by going to First Peoples Buffalo Jump State Park and River's Edge Trail. There's lots more to do: identify plant and animal life at Giant Springs State Park, take in the architecture and atmosphere at St. Ann Cathedral, make a splash at Electric City Water Park, and admire the masterpieces at Paris Gibson Square Museum of Art. For photos, where to stay, and tourist information, refer to the Great Falls trip site . You can drive from Glacier National Park to Great Falls in 4.5 hours. Another option is to do a combination of car, train, and bus. June in Great Falls sees daily highs of 76°F and lows of 47°F at night. Wrap up your sightseeing on the 12th (Wed) early enough to travel to Dillon. Dillon is a city in and the county seat of Beaverhead County, Montana, United States. On the 13th (Thu), stop by The Bookstore, get engrossed in the history at Dillon Visitor Center, then see the interesting displays at Beaverhead County Museum, and finally mingle with the ghosts of the past at Bannack State Park. For reviews, maps, other places to visit, and more tourist information, you can read our Dillon trip planner. Traveling by car from Great Falls to Dillon takes 3.5 hours. June in Dillon sees daily highs of 76°F and lows of 45°F at night. Wrap up your sightseeing on the 13th (Thu) to allow time to travel to West Yellowstone. Satisfy your inner culture vulture at Earthquake Lake and Yellowstone Historic Center. Get outdoors at Grizzly and Wolf Discovery Center and Nature & Wildlife Tours. There's lots more to do: cast your line with a fishing tour, look for gifts at Eagle's Store, get in on the family fun at Yellowstone Big Gun Fun, and get your game on at Madison Avenue Old Time Photos. To see reviews, other places to visit, photos, and tourist information, refer to the West Yellowstone vacation builder . Drive from Dillon to West Yellowstone in 2.5 hours. Prepare for a bit cooler weather when traveling from Dillon in June: high temperatures in West Yellowstone hover around 69°F and lows are around 35°F. Finish your sightseeing early on the 16th (Sun) to allow enough time to travel to Cooke City. Cooke City-Silver Gate is a census-designated place (CDP) in Park County, Montana, United States. Start off your visit on the 17th (Mon): stop by Sylvia's Sweet Shoppe, get engrossed in the history at Cooke City Montana Museum, then trek along Clarks Fork Trail, then take some stellar pictures from Clay Butte Fire Lookout Tower, and finally take a memorable drive along Beartooth Hwy. To see other places to visit, maps, traveler tips, and other tourist information, you can read our Cooke City trip itinerary planner . You can drive from West Yellowstone to Cooke City in 5 hours. In June, plan for daily highs up to 66°F, and evening lows to 34°F. Cap off your sightseeing on the 17th (Mon) early enough to travel to Gardiner. Gardiner serves as the gateway to Yellowstone National Park's northern entrance, marked by an iconic stone arch. Kick off your visit on the 18th (Tue): get a new perspective on things with Boat Tours & Water Sports, trot along with a tour on horseback, and then look for gifts at Yellowstone Gifts & Sweets. Get ready for a full day of sightseeing on the 19th (Wed): contemplate the waterfront views at Dailey Lake and then ride a horse along Wilderness Connection. To find maps, ratings, photos, and tourist information, read Gardiner trip planner . You can drive from Cooke City to Gardiner in 2 hours. Expect a daytime high around 69°F in June, and nighttime lows around 35°F. Cap off your sightseeing on the 19th (Wed) early enough to go by car to Bozeman. Bozeman is a city in and the county seat of Gallatin County, Montana, United States, in the southwestern part of the state. Head to Bozeman Public Library and The Last Wind-Upfor plenty of shopping. Get some cultural insight at Museum of the Rockies and The Soldiers Chapel. Explore the numerous day-trip ideas around Bozeman: Big Sky (River Rafting & Tubing, Lone Peak, & more). It doesn't end there: take an in-depth tour of American Computer Museum and get to know the fascinating history of Downtown Bozeman. Inspirock's itinerary builder makes planning a Bozeman trip simple and quick. Getting from Gardiner to Bozeman by car takes about 1.5 hours. Other options: take a bus. Traveling from Gardiner in June, things will get a bit warmer in Bozeman: highs are around 77°F and lows about 45°F. Finish your sightseeing early on the 22nd (Sat) so you can drive to Billings. Billings is the largest city in the state of Montana, and is the principal city of the Billings Metropolitan Area with a population of 166,855.Billings is located in the south-eastern portion of the state and is the seat of Yellowstone County, which had a 2015 population of 157,048. Satisfy your inner culture vulture at Little Bighorn Battlefield and Moss Mansion. For shopping fun, head to Bighorn Trout Shop or Toucan Gallery. There's still lots to do: admire the majestic nature at Pictograph Cave State Park, take a pleasant ride with a tour on horseback, browse the different shops at Rimrock Mall, and learn about winemaking at Yellowstone Cellars & Winery. For photos, where to stay, more things to do, and more tourist information, go to the Billings trip planning app . Getting from Bozeman to Billings by car takes about 2.5 hours. Expect a bit warmer evenings in Billings when traveling from Bozeman in June, with lows around 54°F. Wrap up your sightseeing by early afternoon on the 26th (Wed) to allow time for travel back home.